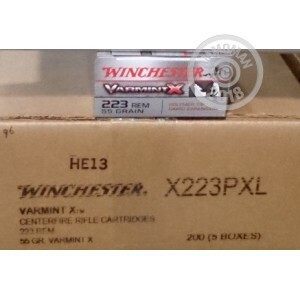 Give those pesky coyotes and prairie dogs Xes for eyes with this Winchester Varmint-X ammunition. These .223 Remington cartridges deliver superb accuracy and instant fragmentation for rapid elimination of small animal targets. Each cartridge in this box of 40 fires a 55 grain polymer tipped projectile with a thin jacket designed to break apart quickly for immediate effect. 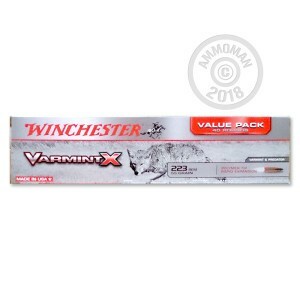 Got a big pest problem or want to try a few different types of ammo without paying an arm and a leg for S&H? Get free shipping from AmmoMan.com when you place an order for $99 or more.